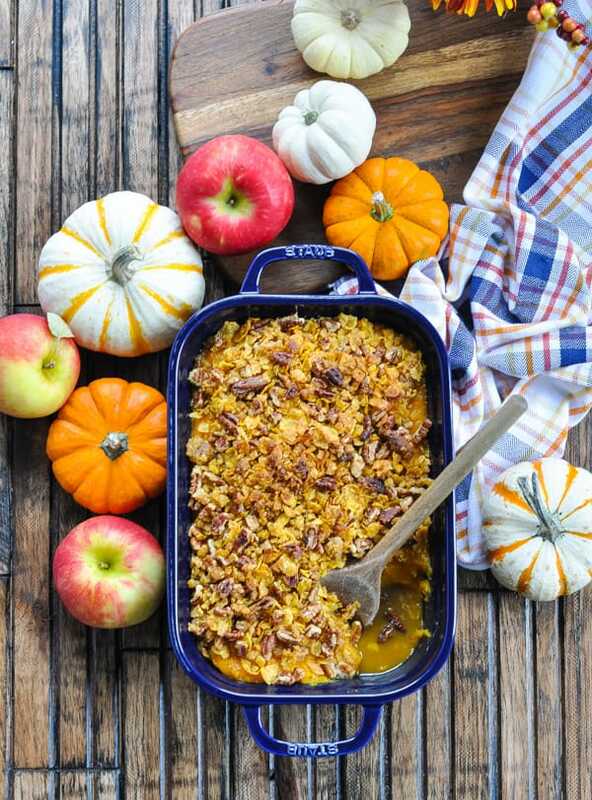 Sweet and savory, buttery and crunchy, this Apple and Butternut Squash Casserole with brown sugar and pecans has it all! 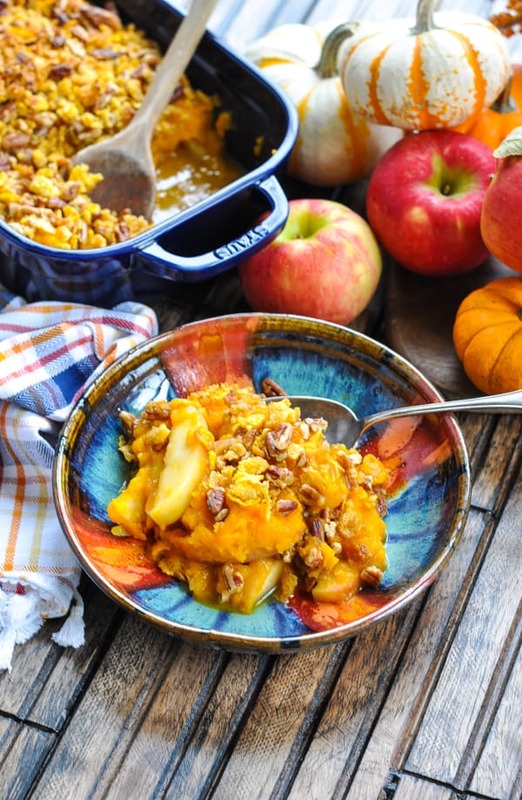 Sweet and savory, buttery and crunchy, this Apple and Butternut Squash Casserole with brown sugar and pecans has it all! The festive make ahead side dish has been a family favorite for over 40 years, and it’s the perfect addition to your next holiday table! This roasted butternut squash casserole has made an appearance on my mom’s Thanksgiving table every year for my entire life (and much longer than that!). As I understand it, my mom received the recipe from her friend when their husbands were in law school together…oh, about 40 years ago! It has been served every fall since then. It’s that good. 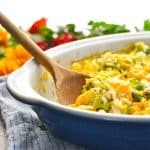 Butternut squash casserole recipes are a staple in many households at this time of year, and this particular recipe is the absolute BEST. 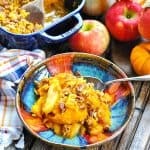 The dish combines apples, whipped butternut squash, pecans, brown sugar, and butter into one amazingly tasty casserole. It’s the perfect complement to a big turkey dinner, but it also works equally well with a roasted chicken on a cool, autumn, evening. First, let’s roast the butternut squash! Start by cutting it in half lengthwise and scooping out the seeds. 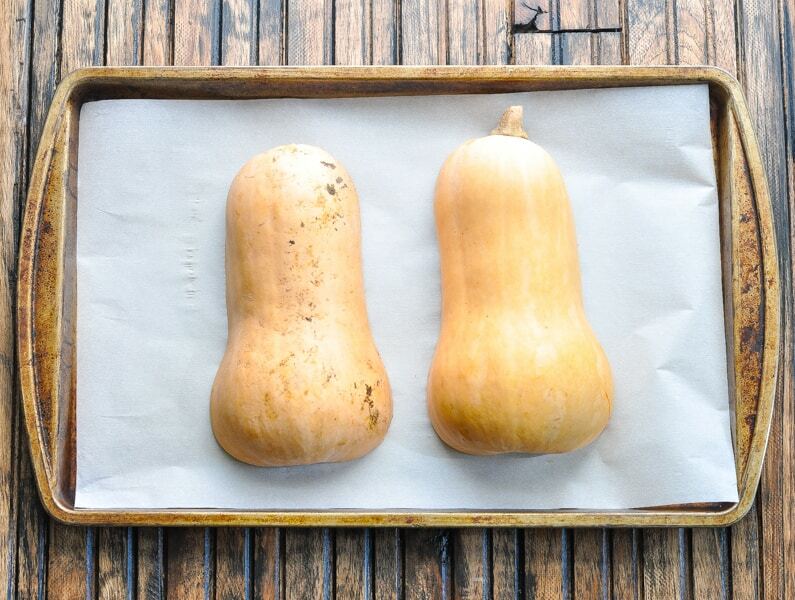 Place the squash skin-side up on a parchment-lined baking sheet. 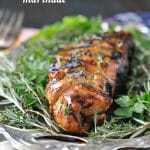 Pop it in the oven and roast at 425 degrees F for about 30 minutes. 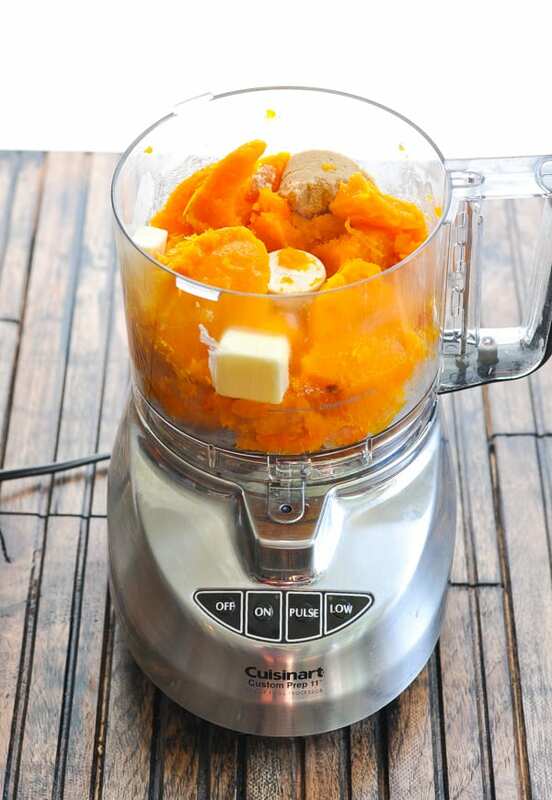 Scoop the warm flesh out of the squash and place it in a food processor (or blender) with brown sugar, butter and salt. The butter will melt as it whips with the warm squash, so there’s no need to melt it in advance. Process the roasted butternut squash until it’s fluffy and smooth. While the squash roasts in the oven, I like to get the apples ready as well! 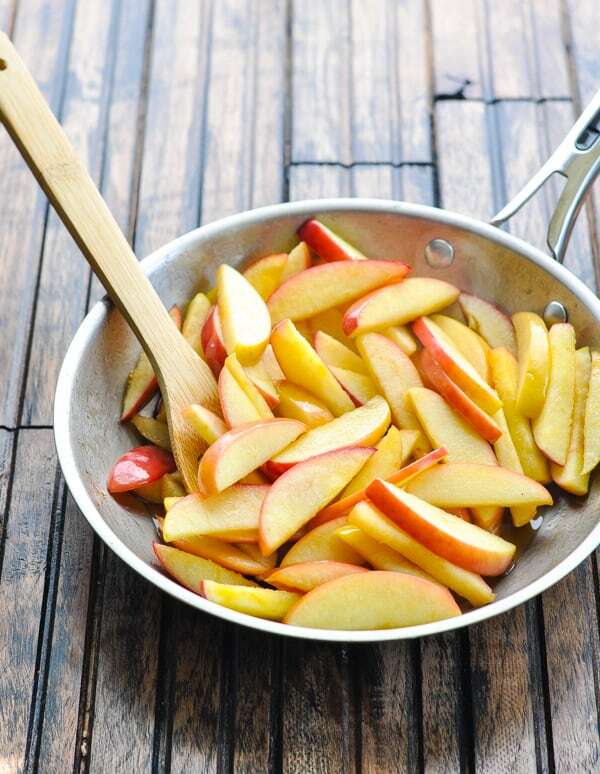 Simply pan fry the apple slices in butter with brown sugar until tender (about 10-15 minutes). 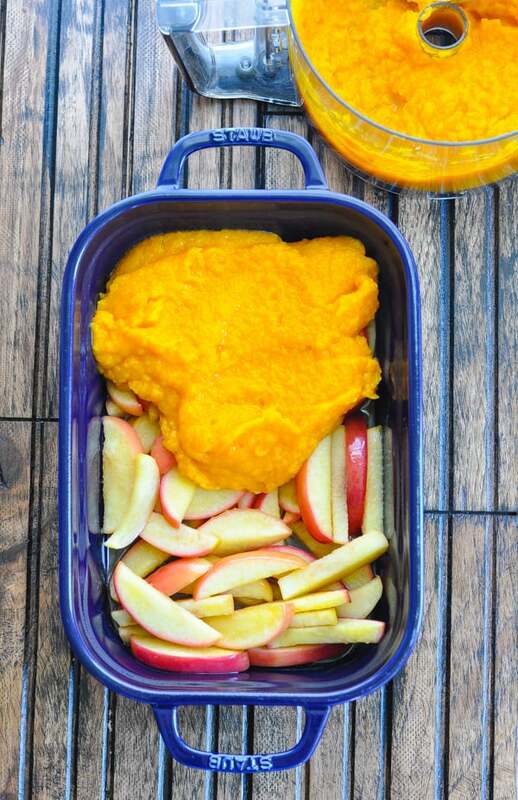 Place the cooked apples in the bottom of a 3-quart casserole dish and spread the whipped squash over top. Finally…the topping (and perhaps the best part)! 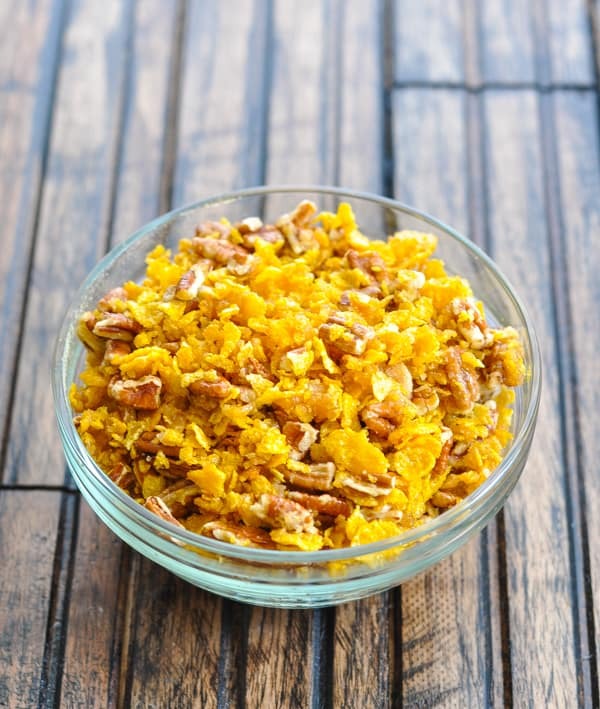 This combination of Corn Flakes, brown sugar, pecans, and melted butter gets sprinkled over top of the dish. After about 25-30 minutes in a 350-degree oven, the Apple and Butternut Squash Casserole will be heated through and crispy, golden brown on top. Oh my gosh, it’s side dish perfection! 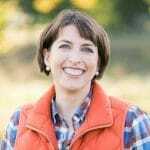 Can you freeze Butternut Squash Casserole? Yes! 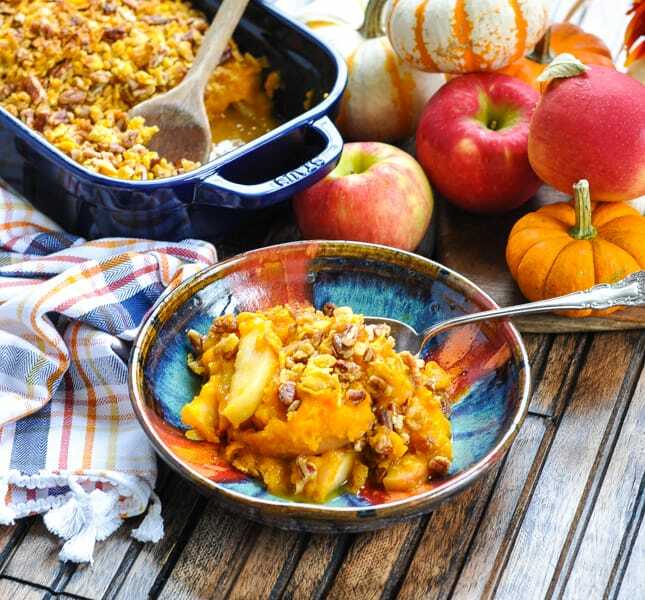 This Apple and Butternut Squash Casserole is a make ahead side to take the pressure off of a busy holiday meal. 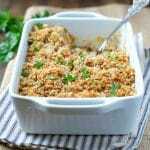 To freeze or refrigerate the casserole and bake it later, assemble the casserole through Step #3 — before adding the topping. Let the casserole come to room temperature, wrap tightly, and freeze for up to 2 months. To bake from frozen, thaw in the refrigerator overnight. Allow the refrigerated casserole to come to room temperature, sprinkle with Corn Flakes topping, and bake according to instructions below. Prep ahead! My mom always makes this casserole at least 1 or 2 days in advance of Thanksgiving so that she’s not scrambling and rushed at the last minute. 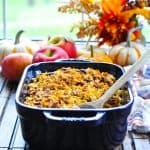 You can freeze the casserole (as described above), or just keep it refrigerated for a few days. If prepping the casserole ahead, do not add the Corn Flakes topping until right before baking. Otherwise it will become soggy. You can use any variety of apples that your family enjoys. 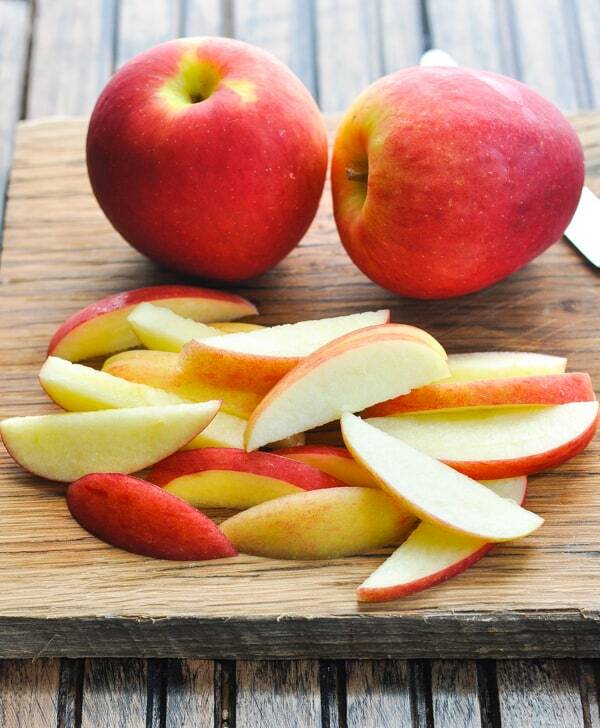 We often pick a blend of Granny Smith, Honey Crisp, Fuji, Gala or Jazz apples. This offers a nice balances of firm texture and sweet-tart taste. Feel free to replace the chopped pecans with chopped walnuts or slivered almonds if you prefer. While the recipe says that it yields 8 servings, that’s being conservative. With a big Thanksgiving spread, this dish will probably feed a lot more than 8 people. It’s rich, and a little bit goes a long way — especially when combined with Southern Cornbread Stuffing! Cut the squash lengthwise in half. Scoop out the seeds. Place the squash skin-side up on a foil-lined baking sheet and bake at 425 degrees F for 30 minutes, or until tender when pierced with a fork. 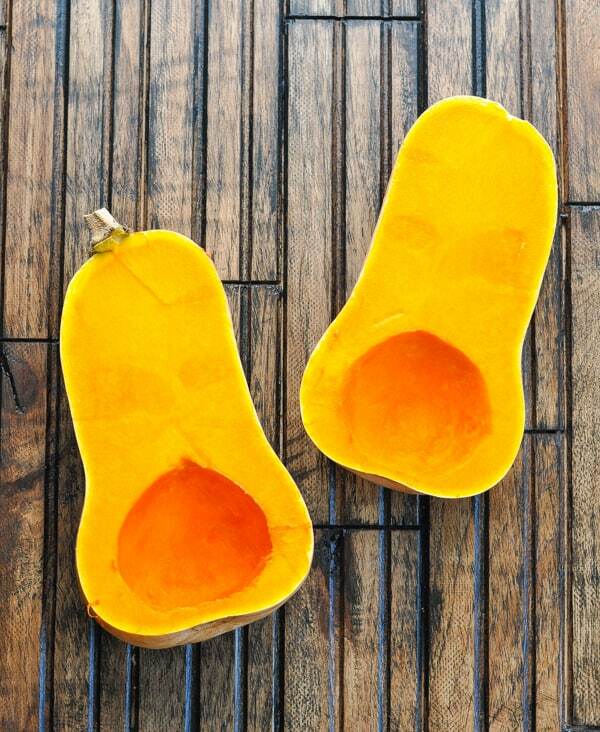 While the squash roasts, melt 2 tablespoons butter in a large skillet. Add apples and ¼ cup of brown sugar. Sauté until apples are soft (about 10-15 minutes). Place in the bottom of a 3-quart casserole dish. 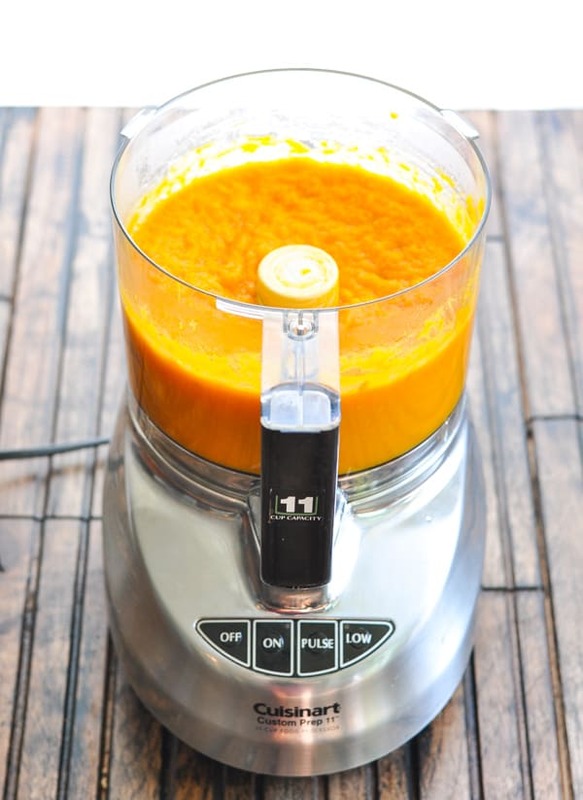 Using a large spoon, remove the cooked flesh of the squash and place it in a food processor or blender. Add 2 tablespoons of butter, ¼ cup of brown sugar, salt, and process until smooth. Spread the whipped squash on top of the sautéed apples in the casserole dish. Crush the Corn Flakes and place them in a small bowl. Add the chopped pecans and the remaining ¼ cup of brown sugar. Combine with 3 tablespoons of melted butter. Sprinkle the topping over the squash. Bake, uncovered, at 350 degrees F for 25 minutes, or until heated through. Yes! 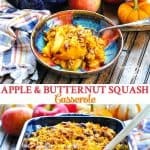 This Apple and Butternut Squash Casserole is a make ahead side to take the pressure off of a busy holiday meal. To freeze or refrigerate the casserole and bake it later, assemble the casserole through Step #3 -- before adding the topping. 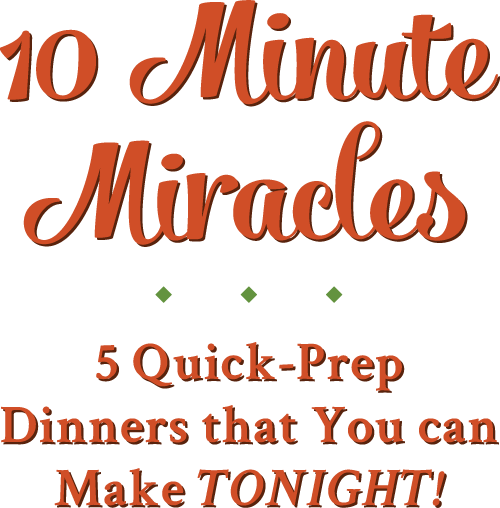 Let the casserole come to room temperature, wrap tightly, and freeze for up to 2 months. Prep ahead! My mom always makes this casserole at least 1 or 2 days in advance of Thanksgiving so that she's not scrambling and rushed at the last minute. 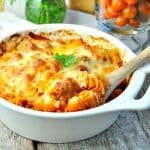 You can freeze the casserole (as described above), or just keep it refrigerated for a few days. 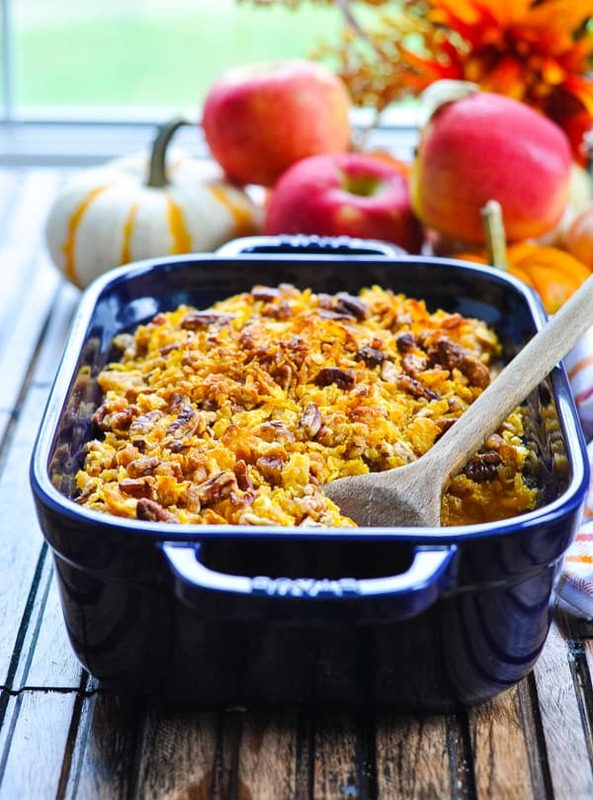 If prepping the casserole ahead, do not add the Corn Flakes topping until right before baking. Otherwise it will become soggy. While the recipe says that it yields 8 servings, that's being conservative. With a big Thanksgiving spread, this dish will probably feed a lot more than 8 people. It's rich, and a little bit goes a long way -- especially when combined with Southern Cornbread Stuffing! This post was originally published in November, 2013. It was updated in October, 2018.